This happens the last week in a game. Red Pivot blocks White Jammer to the inside and forward, across the apex. For the momentum of the block the and after being returned to the track upright the White Jammer falls down close to the outside line. The White Jammer leaves the track crawling to the outside, skate clockwise and then re-enters into the track behind the Red Pivot . Is this a proper way to cede a cut? I think that the White Jammer is taking advantage of their position in the track at the moment that was down, and choose to "cede the cut" going to the outside, because was the more quickly way for him to re-enters into the track, but in the same way he could choose go back to the inside, that was a bit more far. For this I belive that the White Jammer get some advantage in detriment of the time that the Red Blocker would have to recycle it. I penalize the White Jammer with a cut track, because it not properly cede their cut and explain this posture in a Official Review of the White Team. After the OR other Official pointed out that it should be issue with Skating out of bound penalty instead. Cheers and thanks in advance for your time. I would not issue either a cut or a skating out of bounds for exiting the track to the outside to cede after being knocked OOB to the inside (so long as it was a timely exit). I might consider a cut for someone exiting the track to the inside to cede after being knocked OOB to the outside depending on the skill level at the game in question. There was a play in a game probably around 2014 (I do not remember exactly where/when) where the jammer was knocked OOB to the outside by the other jammer (I believe this was just after the jam start). The in bounds jammer started heading backwards to recycle the OOB jammer back to the prior pass. The OOB jammer crawled across the track from the outside to the inside on their hands and knees. This gave them a much shorter path to re-enter behind the in bounds jammer without getting caught up in the pack on the prior pass. 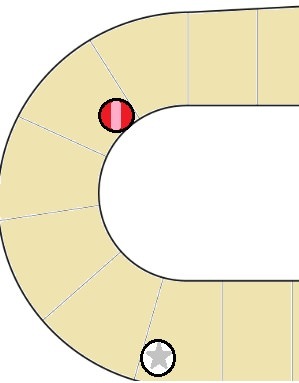 The rules committee decided that that was not playing derby and the next rules set (2015 if i recall correctly) included a rule under the "Skating Out Of Bounds" family that stated that crossing the track from outside to inside while down was a penalty. This is why the other ref you mentioned was making the case for a skating out of bounds penalty. That does not, however, apply here because that was specifically for crossing from outside to inside to shorten the recycle distance. I think a safety issue could also be brought up that crawling back to the inside of the track would be a tripping hazard for other skaters. If the most expeditious way to exit the track was outside then totally legit. Yeah I agree with others, let them take the safest route to cede. First thanks for the answers. To ced the cut the player is not obligated to crawl, so I think that if she choose to do it it's also responsible for the safety of their action. In this image, we can see that going to the external line the white jammer is going to get a more easy path to cede their position and also not being directly behind of any red blocker. So based on that is that i think that it not fair. Having said that, I understand that it can be legal. I think your diagram does a very good job of showing how it would take less effort for the jammer to get behind the pivot going in from the outside than the inside, however I don't think the diagram matches your description of the action - the jammer being hit across the apex all the way to the outside line. I believe the following diagram is more accurate to your description and shows the jammer would actually have a longer distance getting behind the pivot going to the outside than skating to the inside - she gains no advantage. 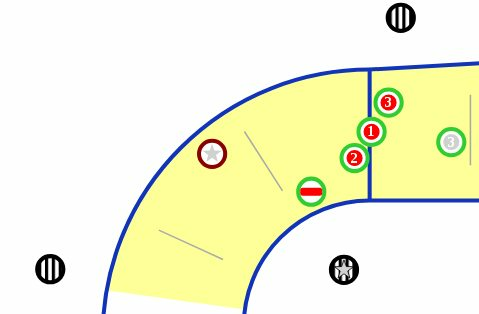 I could see how your diagram could work, if the pivot skated forward, but there would be no need for the pivot to do that and at that point they are giving the jammer the advantage.